There are many ways to travel to and from the Park. Here we share the various routes, options and related information. The Oxford Science Park is located approximately 4 miles south east of Oxford City centre. When travelling from the north use the M40 Junction 9, or from London use the M40 Junction 8. The Park is well signposted however, where not indicated follow signs for the A4074 or the Kassam Stadium (located about 500 metres east of the Park). From 25th July 2016. 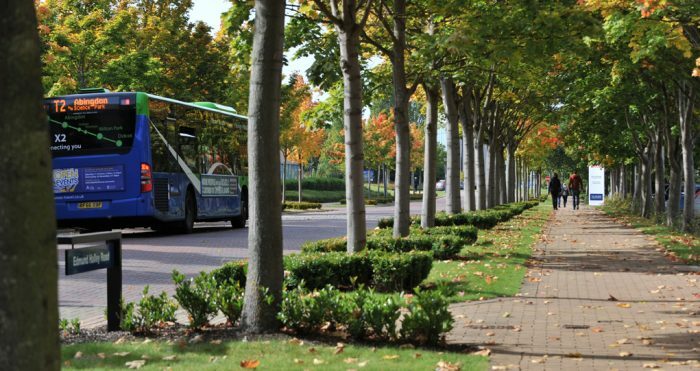 Bus service 3A operates between the City Centre (Speedwell Street) and the Magdalen Centre on the Science Park. Journey Time approx 26 minutes. The new 3A timetable can be found on the Oxford Bus Company website here. The Park is on the Oxford Dual Cycle Network. Details of the local Oxfordshire cycle network can be found here. For details of the National Cycle Network, please click here. The Oxford Science Park car share scheme is a partnership scheme with the company ‘Liftshare’. It provides you with the opportunity to participate in greener and more efficient travel solutions to and from the Park. For further details, visit our dedicated Liftshare website, or to register for the scheme please contact Robert Horsfield. The main smartphone-enabled POD Point electric car charging station can be found outside The Magdalen Centre on Robert Robinson Avenue. You will need to download the POD Point Open Charge App on iOS/Android. For further details, please contact Robert Horsfield. Oxford railway station is approximately 5 miles from the Park. Oxford railway station has regular trains from London Paddington and other cities. Details are available by phoning 0845 748 4950 or on-line from The Train Line or Network Rail. The current London Trains are operated by Great Western Railway (GWR) click here. It is recommended to get a taxi from the Railway station to the Park. In addition, Chiltern Railways has announced that in December 2016, it will operate from Oxford Station to London Marylebone click here.